NOT EVERYONE NEEDS A RECORD LABEL TO SUCCEED! YOU CAN DISTRIBUTE YOUR MUSIC TO MAJOR STORES USING SOME OF THESE DISTRIBUTION NETWORKS THAT I’VE WORKED WITH ALONG THE WAY. THESE ARE MY PERSONAL EXPERIENCES WITH THEM AND I HOPE THAT ONE OF THESE WORKS FOR YOU! FOUNDED BY PHILIP J. KAPLAN, "DISTROKID" IS AN INDEPENDENT MUSIC DISTRIBUTION SERVICE. THIS IS THE PERFECT DISTRIBUTOR IF YOU'RE JUST STARTING OUT. 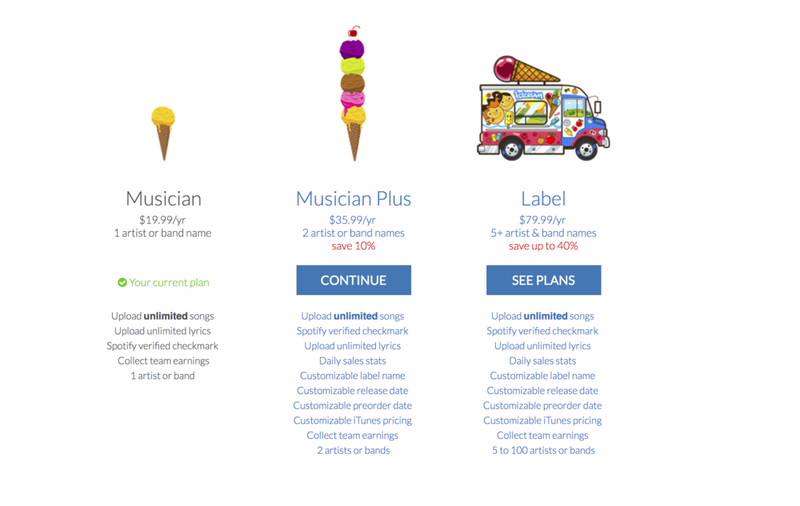 THEY HAVE THREE PLANS: MUSICIAN, MUSICIAN PLUS, AND LABEL. I USED MUSICIAN, WHICH IS ONLY $19.99 A YEAR. YOU KEEP 100% OF YOUR STREAMING REVENUE MEANING ALL THE ROYALTIES YOUR MUSIC PICKS UP IS SENT DIRECTLY TO YOU. - 100% REVENUE IS YOURS. - UNLIMITED UPLOADS FOR $19.99 A YEAR. - SUPPORT IS FAST AND EASILY ACCESSIBLE. - OPTION TO UPLOAD SONG LYRICS FOR APPLE MUSIC. - GUIDE TO SPOTIFY VERIFICATION. - ADD ANY SONG CREDITS (PRODUCER, MIXER, ENGINEER, ETC). - ADD SPLITS. SET UP PERCENTAGES OF STREAMING ROYALTIES TO BE SENT OUT TO OTHER PEOPLE WHO WORKED ON THE TRACK. - OPTION TO UPLOAD ARTIST PHOTO TO APPLE MUSIC (COMES WITH TEMPLATE). - SPOTIFY ARTIST SEPARATION (FOR WHEN YOUR MUSIC GETS LISTED UNDER ANOTHER ARTIST WITH THE SAME NAME, THEY WILL SORT IT OUT AND GIVE YOU YOUR OWN PAGE). - streaming royalties can be sent to you in many payment methods. via paypal, direct deposit (ACH), check VIA mail, etc. - no playlist SUBMISSIONS or CURATORS. - royalties take 2-3 months to show up after the song has been released. TUNECORE IS THE FIRST DISTRIBUTOR I EVER USED. THIS one WAS okay. it's ‘credit-based’ meaning you pay per song or album. as far as features go, it's ALMOST the same as distroKID. THEY OFFER PHYSICAL CD PRINTING, COVER SONG LICENSES, AND MIXING/MASTERING SERVICES FOR EXTRA MONEY. I ABANDONED TUNECORE AFTER FINDING DISTROKID AND IF YOU COMPARE THE TWO YOU'LL UNDERSTAND WHY. THE PRICING IS WEIRD HERE. IF YOU'RE ONLY TRYING TO UPLOAD A SONG OR TWO IN A YEAR, THEN THIS IS FOR YOU. IF YOU'RE CONSTANTLY UPLOADING SINGLES YEAR ROUND, THEN I RECOMMEND DISTROKID. level music reached out to me a few months back. they're in their beta stages, so they're still fresh in the world of distribution services. they promise you 100% of streaming royalties and since it is in its beta stages: it's free. the layout is aesthetically pleasing and the site is easy to navigate. THE ONLY Payment method to withdraw your earnings is THROUGH PAYPAL. LEVEL MUSIC PITCHES you to playlists meaning that they send your music to CURATORS for APPROVAL and that's how you INCREASE STREAMS FOR YOUR MUSIC. i've been added to apple music's 'indie pop' and 'the plug' since i used level. this is still a very new concept for distribution services and it is helping a lot of artists gain exposure and STREAMS. this would result in bigger royalties as well, meaning MORE MONEY for your music. support is also very fast and email-only. my only con: i wish it had distrokid features. apple music profile photo support OR lyric additions. it is still in beta stages SO THIS IS BOUND TO CHANGE.